Thanksgiving is a time where families and friends come together to be thankful for all that they have. However, one conversation you should consider having around your family dinner table is about death. Did she just say "death"? That's right, I said death. As much as an uncomfortable topic as it is, it's one you should be having with almost every family member you have. Whether it's with your grandparents, spouse, or siblings who have children under the age of 18, estate planning is important at any age. The first step in the estate planning process is just having the conversation. Pam wrote a blog post about "Death Over Dinner" but another organization that helps with those tricky conversations is called The Conversation Project. This resource focuses more on end of life care, and has a handy PDF tool that you can use to start the conversation. Did you know?? 82 percent of people say it's important to put their wishes in writing but only 23 percent have actually done it? * Using websites like The Conversation Project can start those important conversations about estate planning. Another reason why it may be easier to talk about death over the dead turkey is because you're all trapped in the same house (for at least the meal and probably for the digestion). Sometimes having the hard conversations when people are stuck in the same location can help facilitate the conversation along. For example: My family and I were driving back from an event and we had about 45 minutes until we reached our destination. So, I asked my dad "Dad, what happens to you when you die? Do you want to be buried or cremated? Do you have a will, and if so, where do we find it?" Even though the conversation caught him off guard and it made my sisters uncomfortable, it was information we all needed to not only hear but know. Plus I actually learned a lot from it, like where to find his will and who is designated as his executor. Another thing is by having this conversation it can give you a peace of mind. What if this is the only conversation that's ever been had about planning for their future estate? What if your family member hasn't done any estate planning at all or updated their documents in over 20 years? What if you're the executor of your parents estate and they haven't informed you? By knowing the details of their estate and end of life plans earlier than later can help give clarity when emotions are running high. For those family members who do have their estate planning done, by communicating your wishes in advance, they may be more likely to be followed. Having this discussion is hard; there is no doubt about that. 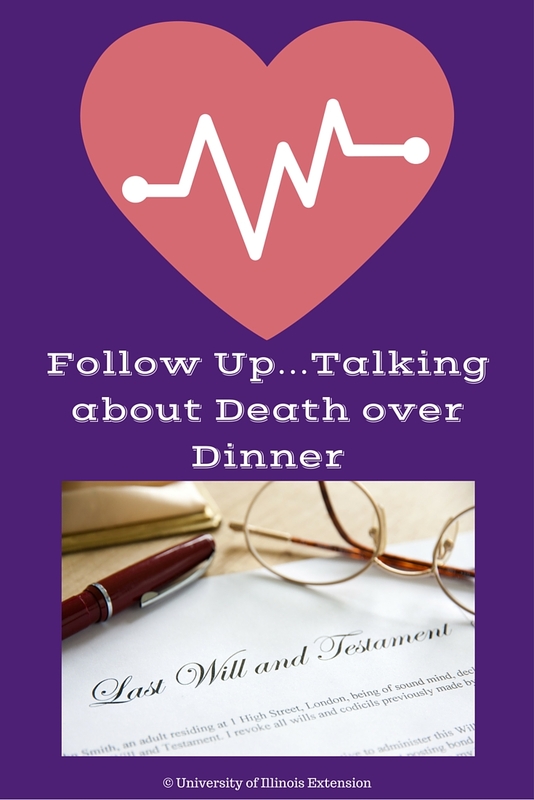 Try using the death over dinner or the conversations project websites to initiate the discussion. Sometimes being trapped together is a good thing because it can help more the conversation along. Thanksgiving is about being thankful, and when family members have their estate plan done, it can halt chaos or fighting in a family before it happens and that's definitely something to be thankful for.